Black and white image of a group of men gathered around a piano in a studio. One young man sits on a bench in front of the piano keyboard, with another standing behind him. The young man in the center of the group sits on the piano, while the remaining two lean against the piano body with their elbows supporting them. Four of the young men wear short, dark patterned suit coats over dark slacks, while the fifth wears a light colored suit jacket and light pants. All wear ties and light shirts. Their hair is long and parted on the side and combed over. 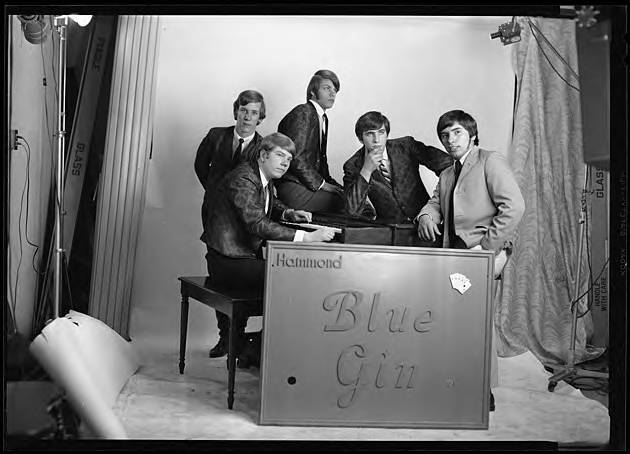 A board in front of the group identifies them as the 'Blue Gin' band, with a five playing cards arranged in formation at the upper image right of the sign. 'Hammond' is printed at the top of the sign, but may indicate the Hammond piano company as a sponsor of the group.